The tiny memory cards. See, tiny next to a pencil. Tiny. 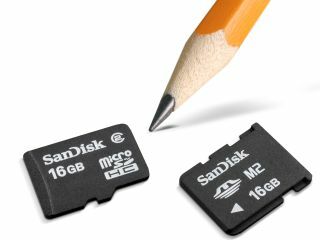 With mobile storage increasing almost daily, expanding a handset with one of these bad boys could help you get up to 32GB of space... unless you have an iPhone. Then you can't. It doesn't have a memory card slot, see? But for all of you looking to pick up a Nokia N96, this would be the ideal present to yourself to pack all those movies and photos and music... well, that's if anyone actually uses their phone to use such features...unless you have an iPhone. It has a whopping 3.8in screen, see? Of course, you could also put these in other things, like PMPs or GPS systems, depends on what you're into really. The microSD version will cost £45, which isn't too bad to double your mobile's internal storage. The M2 will cost £60, presumably because it has jagged edges. Well, we couldn't think of a better reason.